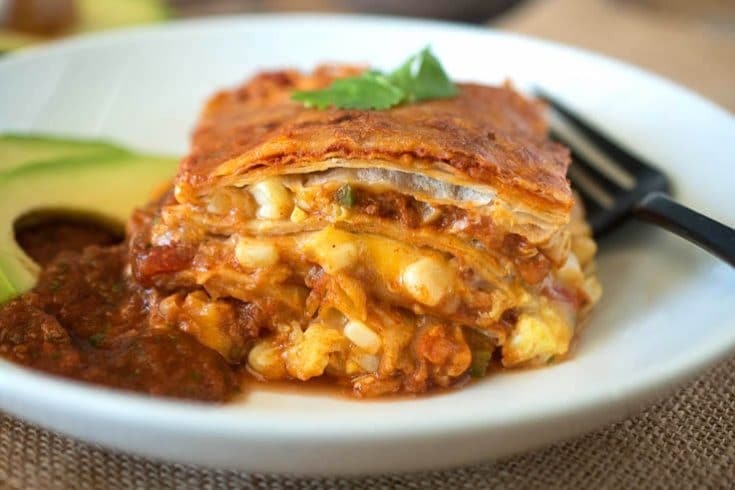 Baked Mexican Breakfast Lasagna consists of layers of chorizo, scrambled eggs, corn salsa, tortillas and cheese. The perfect make ahead brunch or breakfast for feeding a crowd along with a tip for freezing any leftovers. If you’re a fan of Mexican food, you will love this twist on an Italian classic turned into a breakfast. We all know breakfast is the most important meal of the day and being holiday time, chances are you have family visiting and need to feed a crowd. This breakfast lasagna can be made the day ahead, refrigerate overnight and bake the next morning until hot and bubbly. Leftovers are just as good. When I have leftovers, I cut up the lasagna into individual servings, wrap in a double layer of plastic wrap tightly and fill a sealable freezer bag. When you need a hot breakfast, just unwrap and place on a microwave-safe plate and heat on high for 4 minutes. 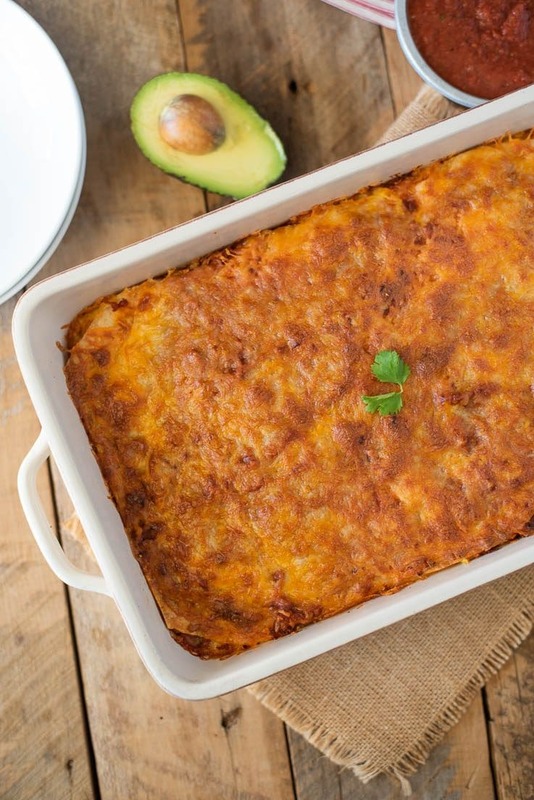 This Baked Mexican Breakfast Lasagna is perfect for those busy weekday mornings. Hands up everyone who just grabs a coffee and hits the road? Yes, you know who you are. Just think, you could whip this dish up on Sunday afternoon, cut a piece off Monday morning, it takes 2 minutes to heat up in the microwave, breakfast, done. You will have breakfast all week long. The flavor key to this dish is the easy chorizo sauce. Chorizo is a Mexican sausage that comes in pork or beef. You can buy it with or without the casing. When it comes to the tortillas I like to mix-it-up. Sometimes I use all flour tortillas, sometimes I use corn tortillas for extra corn flavor and sometimes if I have both, I use both. 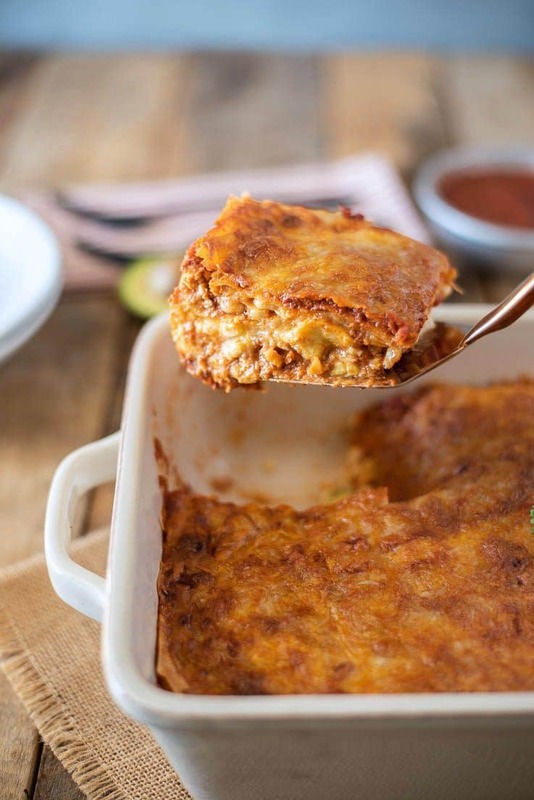 Serve this lasagna with a side of your favorite salsa (an easy recipe for salsa is below) hot sauce and sliced avocado. The quickest way to put this dish together is start by preparing your ingredients. Make the chorizo sauce which is just the chorizo sautéed until cooked then mixed with a can fire roasted diced tomatoes. Next is the easy corn salsa (recipe here) pic above and is great for snacking which adds a delicious sweet bite and since fresh corn is available all year round, is a big help. All that is left is to scramble the eggs, setup your assembly line and it’s time to start building your layers. 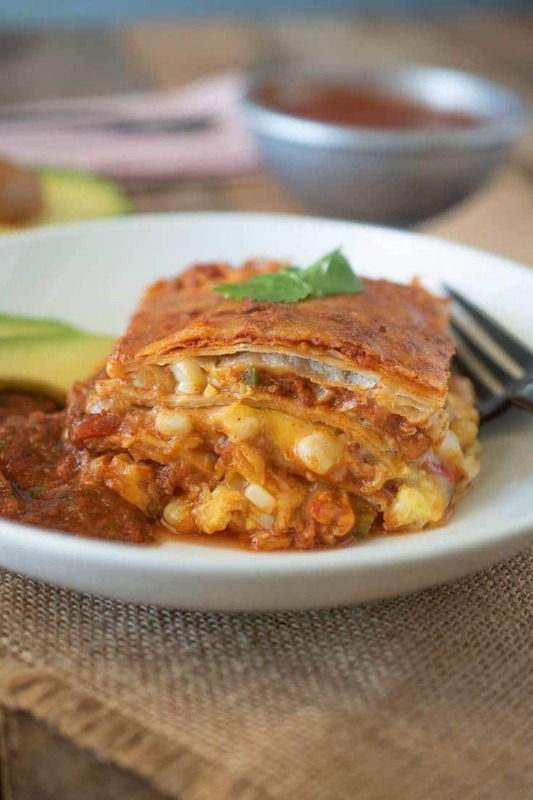 If you’ve tried this Baked Mexican Breakfast Lasagna or any other recipe on the blog then don’t forget to rate the recipe and let me know how you got on in the comments below. I love to hear from my readers! You can also FOLLOW ME on FACEBOOK, TWITTER, INSTAGRAM and PINTEREST to see daily recipe updates. Layers of chorizo, scrambled eggs, corn salsa, tortillas and cheese. 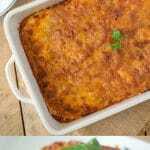 A delicious and easy breakfast lasagna that is a great make ahead dish. 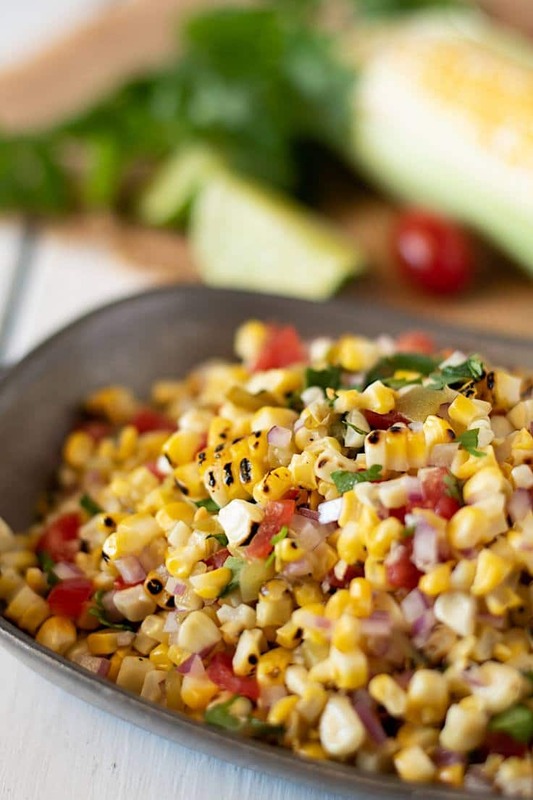 To a bowl, mix the corn, red onion, cherry tomatoes, jalapeno, cilantro, lime juice, salt and pepper. Mix well and set aside. To a skillet over medium heat, add the oil. When hot, add the chorizo, break-up the meat and sauté until cooked. Stir in the crushed tomatoes. Set aside. Skim off any oil that rises to the top. To a separate non-stick skillet, melt the butter until bubbling over medium-low heat. Add the milk and salt to the eggs and mix. Pour into the pan. When the sides of the eggs start to set, stir using a spatula until the eggs are fully scrambled. Preheat oven to 350°F/180°C. Butter the inside of a 9 x 13 -inch (23 x 33 cm) baking dish. To the bottom of the dish add a thin layer of the chorizo sauce. Top with a layer of tortillas, cut to make them fit in an even layer. Top the tortillas with a layer of eggs, chorizo sauce, corn and sprinkle with cheese. Repeat these layers ending with a layer of cheese. Bake in the oven for 20 minutes until the cheese is melted and bubbling. Allow to sit for 20 minutes before cutting. 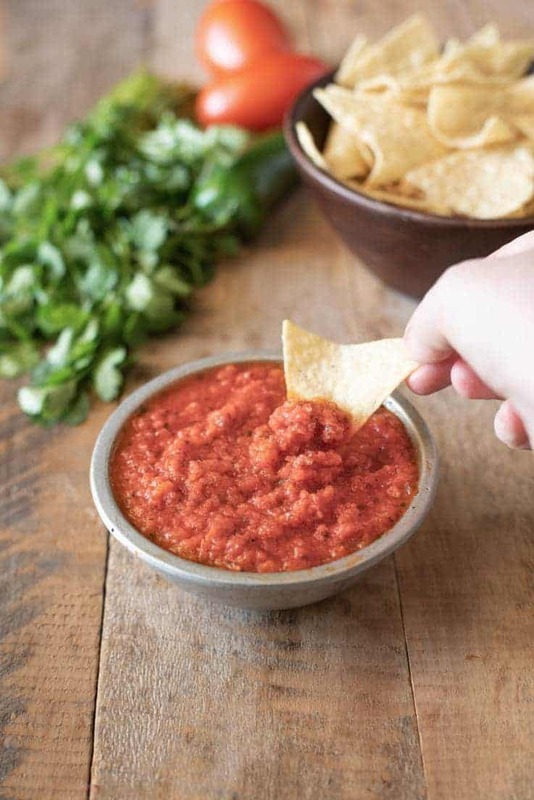 Serve with sliced avocado, your favorite salsa and hot sauce. I know this will be super delicious. Mexican food is our favorite at our house! How many tortillas should be used? They aren’t listed in the ingredients list. Thank you for bringing this to my attention, it looks like the bottom of the ingredients list was cut off but it is all fixed now. I hope you enjoy the recipe and please come back to leave your opinion/review. I’d always rather have a yummy Mexican egg dish for breakfast than anything else! And, this looks awesome! And, then, for lunch, I could eat any leftovers! Mmmm, perfect! This looks so amazing that I’ve got to share it! I’m pinning it and also including it as a feature in my Cinco de Mayo roundup this Friday morning! That looks SO DELICIOUS! I love savory breakfasts like this! Can’t wait to try it!